Women of Wisdom Conference several years ago, I put it on my deck where the birds claimed it as their favorite bath. 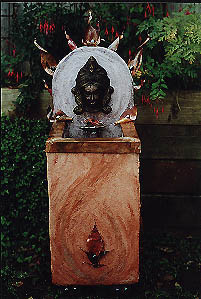 It is made with Copper, a Bronze Kali head from India, Milestone (a concrete hybrid) and glass beads over a recycled styrofoam core. This powerful necklace is made one large cobra (detail above) in the center encircled by 6 smaller cobras and Hematite beads. Available for Purchase: Cobras. Sterling Silver - the outline of this piece reveals two faces coming together. The top is a small cup and the bottom is a functioning bell, both very female symbols. This necklace pendant is made with copper rivets and hand carved Amber. I made this while a student at Boston University Program in Artisanry in 1981. This pendant was hand carved in Sterling Silver, before I learned about lost wax casting. The stone is a Blue Star Sapphire. The Phoenix was holding two snakes in it's talons. This trident pendant is made of Sterling Silver and 24 Karat gold. The pendant is designed to hang down from the end of the handle. This Rattlesnake Head was carved in wax and cast in Sterling Silver. It will eventually be part of a rattle. a specific ratio of Gold, Silver and Copper. This belt is made of re-cycled leather and copper. The belt buckle is made a Copper and Silver, with an engraved image of Boticelli's Venus on the Half-shell.